Surface Temperature Sensing & Control Heat Gun. 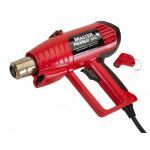 Unlike other LCD display type heat guns which display only the temperature at the nozzle, the Master Proheat STC is the first heat gun to sense, display and control actual SURFACE temperatures. It is now possible to display your work surface temperature, dial-in a target temperature and watch the displayed temperature increase as it approaches and reaches your target temperature.